Sheriff Joke vs. "Joe Arizona"
The biggest story of the day, locally, has been the case where Nick Tarr, who plays "Joe Arizona" in commercials pushing Prop 201, was cited on Halloween night for impersonating a DPS officer by the Sheriff's Department. 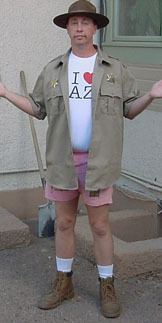 Nick was wearing a Smokey The Bear hat, a t-shirt that said "I (Heart) Arizona", a DPS uniform jacket with the DPS patches on the shoulders (open to show the t-shirt), a kid's Sheriff's badge, and pink boxer shorts, along with white socks and hiking boots. That doesn't sound very much like what a typical DPS officer wears to me... especially on Halloween... but there's one more fact to bear in mind: Sheriff Joe supports Proposition 202, the competitor to Proposition 201. And Sheriff Joe's second in command, an enormous fat-gut by the name of David Henderschott, was in the pub at the time that "Joe Arizona" came in. And "Joe Arizona" has been making fun of Sheriff Joe. Politics? It doesn't matter. "Joe Arizona" appeared on all the local talk radio programs today, accusing Sheriff Joe of attempting to suppress a political opponent. Nick Tarr is a likable guy who's good with words, leaving Sheriff Joe to hide behind "I support my officers". "Joe Arizona" also appeared on all the local television shows today. Sheriff Joke, who never met a camera he didn't like, is suddenly in the unlikely position of facing someone even more publicity-hungry than he is... and "Joe Arizona" is pushing it to the limit. Heh. It's a sad day when a soon-to-be unemployed comedian and actor who, three months ago, was reduced to making balloon animals at children's birthday parties, is the only person in this entire state who seems capable of exposing Sheriff Joe Arpaio for what he is: a joke. If you saw someone wearing a brown shirt with a Department of Public Safety patch, a tin sheriff's badge and a "Smokey Bear" hat, would you think he was a police officer? What if the shirt was open, he was wearing pink boxer shorts and it was Halloween? Some Maricopa County sheriff's detectives apparently thought others at a downtown Phoenix restaurant might be confused. So they cited Nick Tarr for impersonating a DPS officer. But Tarr, better known as the "Joe Arizona" spokesman for one of the gaming issues on the ballot, said he thinks he's the one who is the victim of a crime. Tarr and his attorney, Lisa Hauser, said the detectives were using their official capacity to squelch his political point of view - one that is opposed by Maricopa County Sheriff Joe Arpaio. 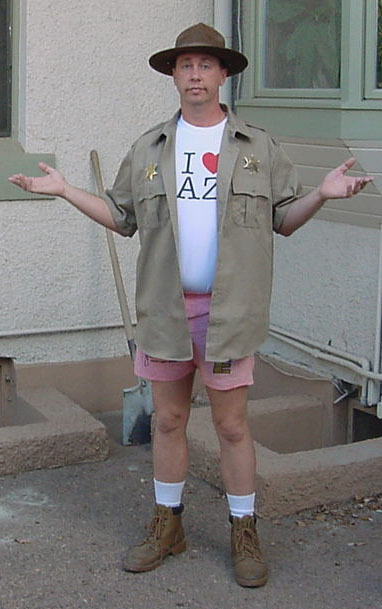 Phoenix, Arizona -- As reported by the Thoroughbred Times: ``The actor who portrays `Joe Arizona,' the personification of Arizona racetracks' slot-machine campaign Proposition 201, was arrested on Thursday for his Halloween impersonation of a highway patrol officer. ``Actor Nick Tarr was at a downtown Phoenix restaurant dressed in pink boxer shorts, a brown highway patrolman's shirt, and Smokey the Bear hat. Officers detained Tarr for an hour before citing him. The actor called the move political retribution from Maricopa County Sheriff Joe Arpaio—a proponent of Proposition 202, the Native America initiative that would bring more gambling to state reservations. ``Tarr said his attire was an attempt to spoof the sheriff's reticence to debate him on the gaming issue. ```Clearly, I'm not trying to deceive anyone that I'm a law-enforcement officer,' Tarr said. ``Tarr is scheduled to appear in court on December 6. He is charged with a Class 1 misdemeanor for impersonating a police officer. If convicted, Tarr could face up to a year in jail plus fines..."